Smoke and sparks fly as you try running your newest repair job. It’s time again for brush replacement. Let's take a look at how to remove the dryer brushes without damaging field wires and also what to do when damage occurs. The first step of brush removal seems obvious, to remove the two clamp screws, but hold off on that for a moment. Take notice, there is a field wire that is plugged into the front of the brush. The actual first step is to take a slotted screw driver, slide it between the field wire tab and the plastic part of the brush, and start to gently leverage the tab away from the brush (see picture). You will only be able to get it started as you will run out of space. 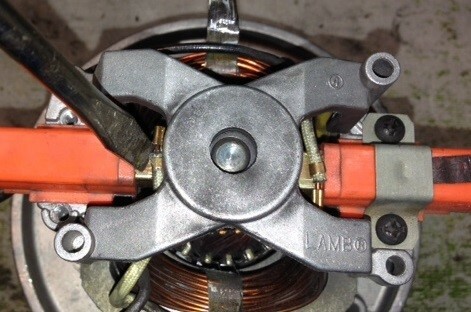 Now is the time to remove the brush clamp and its two screws. From here you may slightly lift the brush and further coax the field tab out of the brush. Note that sometimes these can be real pain to remove. I will occasionally take a chisel, lay it flat on the brush plastic, and carefully tap it to crack the brush plastic for easy removal of the field tab. If the field tab does break off, do not panic (see illustration A for a good field tab and B for a broken one)! There is a solution, it just takes a little doing. First, you will snip off the piece of the crimp that is often left on the field wire. Then remove a quarter inch of the heat wrap. 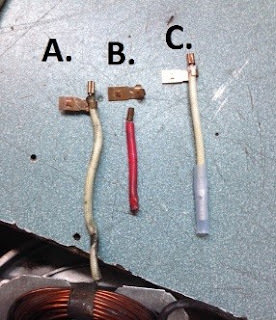 Do not miss this next step: you must scrape the quarter inch of exposed wire and remove the laminate coating, as it is continuity resistant (see illustration D for a scraped wire, shiny, and E for an wire with the coating on it, dull). Next you will need a replacement Brush Clips (see illustration C) that you can purchase through The Edge Pro. 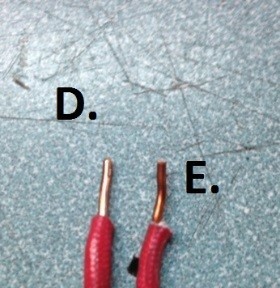 You will place the crimp of the new clip over your scraped wire and crimp down. You have solved the problem and are now ready to install your new brush set!